Hilarious and heartfelt barely scrape the surface of transgender performance artist-turned-cabaret singer Baby Dee's wondrous set on the second day of Sled Island. 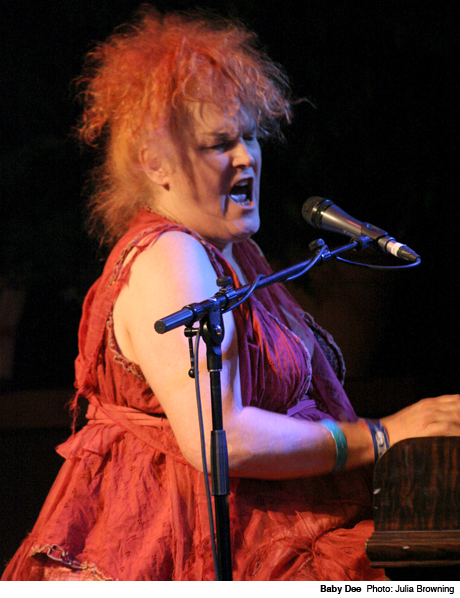 Dressed in a flowing, gauzy gown, a mop of frizzy pinkish blonde hair atop her head, Dee took a seat at an upright piano and pounded the keys, alternating sweepingly sad numbers about domestic violence and Jesus with playful ditties rhyming "Dino Town" with "albino down" and leading a group sing-along about a crackwhore who's "not the only pisspot in the house." Her voice soared and cracked, bellowed and whispered, but it rang true. She sang and played with such relentless abandon that her set transcended entertainment and became inspirational. If Baby Dee can be her real self, we all can.